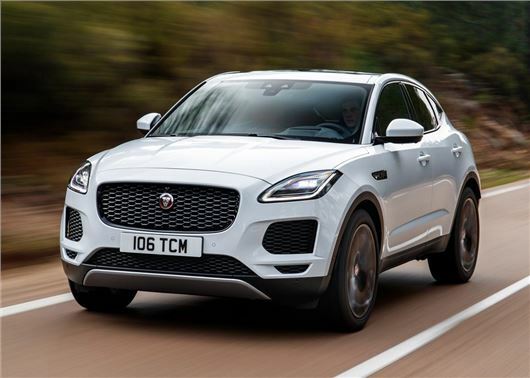 Jaguar has announced a new 200PS petrol engine for its E-Pace small SUV. When fitted with the new 2.0-litre turbocharged Ingenium engine, the E-Pace will be priced from £33,260 and will hit 60mph in 7.7 seconds. It'll return 34.4mpg and emit 186g/km CO2. Other engines already available in the E-Pace include 250PS and 300PS versions of the same 2.0-litre Ingenium petrol engine, as well as a 2.0-litre diesel with 150, 180 or 240PS. Alongside the new engine, Jaguar's introducing clever self-learning technology dubbed Smart Settings. These have recently made their debut on the electric I-Pace SUV, and will learn the driver's habits to make their life easier. The E-Pace will now recognise a driver based on both their key and their phone's Bluetooth - adjusting the seat, climate and infotainment based on their usual preference. Over time, this will retain a driver's preferred requirements using algorithms based on time, location, weather and behaviour patterns. For example, if it's cold, the car will heat up the seats and steering wheel in advance of the driver getting in the car. If the driver listens to a different radio station at a certain time of day or week, it'll change this in advance. The Predictive Call List feature learns patterns of phone use to suggest calling certain people in your phonebook at a certain time. Smart Settings is part of the Connect Pro Pack, which is currently standard on the E-Pace S and above. Another addition to the E-Pace range is adaptive suspension. This lets the driver flick between normal and dynamic settings for the adjustable dampers, with the former focussing on comfort and latter calibrated to increase body control and road handling. The changes are available on all E-Pace models ordered from now, with prices starting at £28,500.